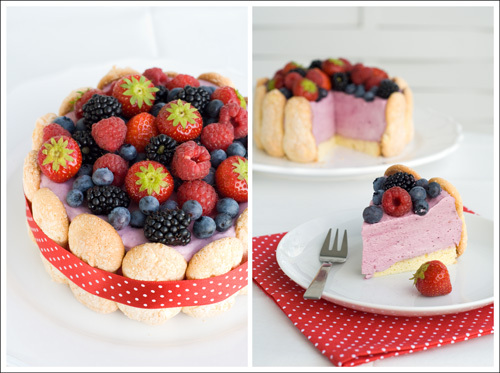 Berry Lovely: Berry Charlotte for my 3rd Blog Anniversary! 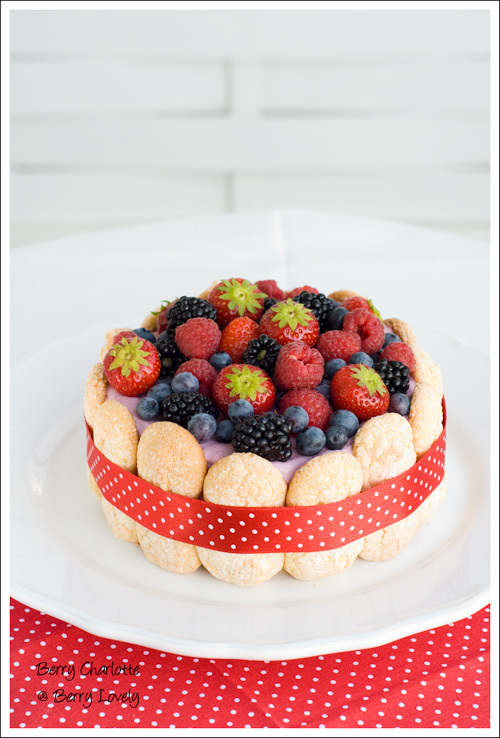 Today is the 3rd anniversary of my blog, and to celebrate this occasion I have made another berry-themed cake for you. 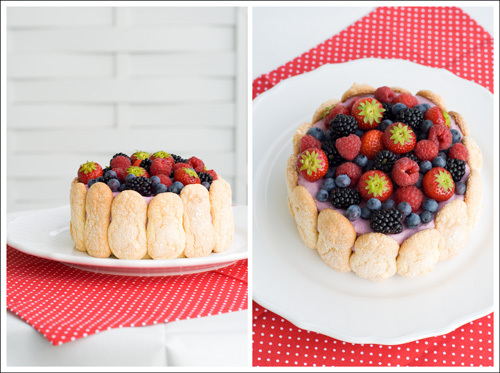 Since “berry lovely” is the name of this blog, I wanted to create something with berries, like what I did for each blog anniversary. 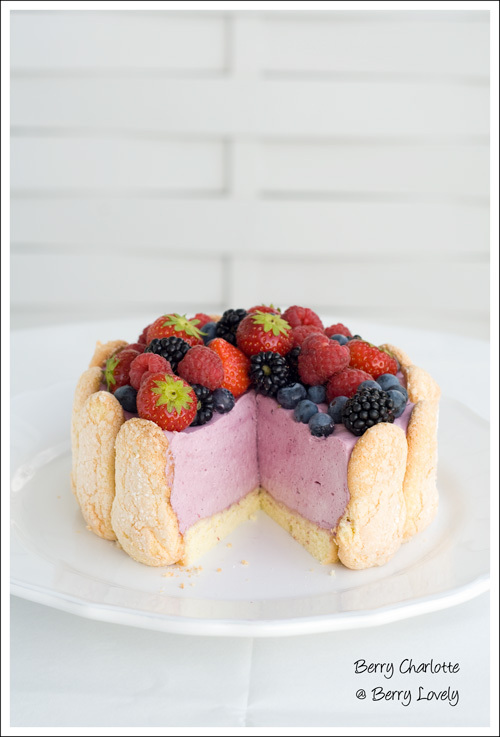 It is a Berry Charlotte, and it is made of ladyfingers with a ladyfinger base and filled with a berry mousse. I also used a generous portion of fresh, mixed berries to accentuate its berry-loveliness. I wanted to make a mousse which is similar to a Bavarian Cream, but I also wanted to include mascarpone in it, like in a TiramiSu. So I tried to combine the two, and it worked out perfectly. I even got the amount for the gelatin right at the first try. Now, there was a bit of an obstacle. Since this summer has been very cold and rainy, the berry season has been particular short. While there usually is an ample supply of berries in our garden, the season is already over for us this year. So I made a compromise, and bought some fresh berries from the local farmer’s market. They were still very beautiful, a bit expensive, but I would say the end justifies the means, and hubby agrees. I love berries; they’re lovely. I still love that blog name. Preheat your oven to 175° C (350° F) degrees, then line your baking sheet with parchment paper. Also line a 18 cm (7-inch) round springform with parchment paper. Fit a pastry bag with a plain tip and fill with the batter. Pipe the batter into 5" long and 3/4" wide strips leaving about 1" space in between the strips. Continue with piping a the batter circular into the springform pan to make a disk shape. Hold the parchment paper in place with your thumb and lift one side of the baking sheet and gently tap it on the work surface to remove excess sprinkled sugar. Bake the ladyfingers for about 10-12 minutes, until the puff up, turn lightly golden brown and are still soft. Allow them to cool slightly on the sheets for about 5 minutes and then remove the ladyfingers from the baking sheet with a metal spatula while still hot, and cool on a rack. Store them in an airtight container till required. After the ladyfingers, bake the ladyfinger batter you piped into the springform pan for about 14-16 minutes, until golden brown. Let cool slightly in the form, then remove and cool completely on a wire rack. Thaw the berries and puree the in a mixer with 2-3 tbsp. sugar. Strain the puree through a fine mesh sieve. In a metal bowl over a water bath on medium high heat whisk together the egg yolks, 2 tbsp. of sugar and the Grand Marnier. Keep stirring the mixture until thickened. Take off the heat and slowly pour in the berry puree, reserving 3 tablespoons of it. Whisk until everything is well combined. In a small saucepan heat up the reserved berry puree. Add the soaked gelatine sheets and stir until dissolved. Make sure the mixture doesn't some to a boil. Add the gelatin mixture to the egg yolk mixture and whisk until combined. Also whisk in the mascarpone. In another bowl, beat the egg whites with the salt until stiff peaks form. Carefully fold the egg whites into your mousse. Put the mousse into the fridge for about 10 minutes until it starts to thicken. Whip the heavy cream until stiff peaks form, and slowly fold into the mousse until just combined. Put your ladyfinger disk onto a cake plate. Put a cake ring around it, leaving a little space for the ladyfingers. Arrange the ladyfingers upright around the sides. Fill the mousse in the middle of the cake and smooth the top. Put in the fridge for at least 3-4 hours to set completely. I had some leftover mousse, which tastes delicious with the leftover ladyfingers.